Mark T. Harris, J.D. , has been appointed to the California Fair Employment and Housing Council by Gov. Jerry Brown. 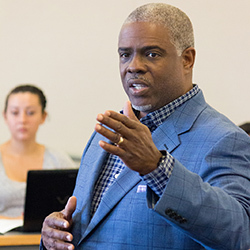 Harris has been a continuing lecturer of management and business economics at UC Merced since 2008 and is a practicing attorney in Sacramento. From 1999 to 2001, Harris served as undersecretary for the California Business, Transportation and Housing Agency under former Gov. Gray Davis. Through his newest appointment, he will focus on promoting employment and housing anti-discrimination laws.